THE OLD CD player/amplifier/speakers combination that’s formed the basis of the majority of hi-fi systems over the years seems to be on the way out. Not so much for the hi-fi cognoscenti who’d only be parted from his system at gunpoint, but rather for your average guy who just wants some music in his home. One of the hot items waiting in the wings to take over is the wireless speaker system. These compact, versatile yet simple devices come in a number of shapes and forms and are finding a lot of favour with consumers, which makes a great deal of sense in the space-challenged digital world we live in today. The younger generation in particular may not own a single compact disc, so why would they want a CD player? They usually have untold quantities of music stored on a notebook computer somewhere and all they want is to be able to listen to it how and when they choose, without clutter or complexity. This is where products along the lines of NAD’s VISO 1 come in. 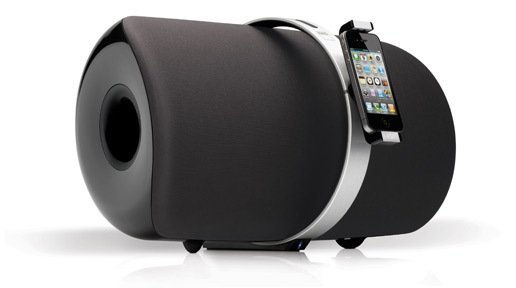 This high-end (for the category) speaker system allows users to dock an iPod or iPhone, to stream CD quality music from any Bluetooth device or even to plug in their TV. It can be easily shifted from room to room if needed and promises high quality sound, which makes it an all-in-one music system that would seem to be ideal for many music lovers. The online images of the VISO 1 are deceiving. For some reason, I imagined it to be about the size of a shoebox but it actually arrived in a large carton that could easily house two bookshelf speakers. Why all the padding? Once the lid was popped, the real picture emerged. This is a big unit measuring 48cm wide by 26cm high and 30cm deep, so a shoebox it definitely isn’t, but that size bodes well in sonic terms (a big cabinet usually equals big sound) – bear in mind that it’s still smaller than the most obvious competitor, B&W’s Zeppelin Air. The VISO 1’s rounded design, gloss black finish and silver metal ring cut down on the sense of bulk and add a distinct touch of style, even of elegance depending on your tastes. A small IR remote is part of the package, while the only controls on the unit are a power switch, source selector and volume buttons. Inside the VISO 1 can be found a bi-amplified NAD Direct Digital amplifier system, which dispenses with any analogue amplification technology. This is the same circuitry that is found in NAD’s much higher end hi-fi kit. A docked iPod feeds its digital stream directly to the VISO 1’s onboard DAC, once again keeping things in the digital domain as long as possible, while the optical digital input accepts high-res signals at up to 24/96. Wireless streaming is handled via the Bluetooth aptX format, which theoretically means that the sound should be of CD quality… but only if the source files are CD quality, of course. The speaker system comprises two small full range drivers and a woofer, which have been optimised by NAD’s sister company, PSB Speakers, with emphasis placed on reducing cabinet resonances and improving the sound radiation characteristics. The frequency response is quoted as 33Hz – 28kHz (-6dB). Operating the VISO 1 is simplicity itself, as expected; dock a compatible Apple device in the very well designed adjustable and rotating docking cradle, turn it on and press play. A moment later, you get music. Pairing Bluetooth devices is also a bit of a doddle and took very little time. The first track I tried with the VISO 1 was a 320kb rip of ‘Stand Inside Your Love’ by The Smashing Pumpkins. This track does great things on the right system and it only really sounds right when it’s played at high levels, so I cranked up the VISO 1 and hit the play button on my 80Gb iPod Classic. The initial drums came in with far more weight, control and intensity than I’d been expecting; in fact, for what is effectively a big iPod speaker system, this was impressive stuff. I nudged the volume up, then up again and when nothing went bang, I just held down the volume button until Scotty said “the engines cannae take no more, Captain”, but funnily enough, this engine could. The VISO 1 was blasting out a raucous rock track at maximum volume, which is quite a bit louder than any other iPod based speaker system I’ve tried. Importantly, it was staying in control with tight, quick bass, no distortion (bar that already on the track), no hissing top end, and it wasn’t blowing up or imploding. Air was pumping out of the single side mounted port as if pushed by a V8, and the poor old cat had very definitely fled the room for quieter surroundings. After around ten tracks at these immodest, neighbour bothering levels, the VISO 1 wasn’t even warm to the touch. Fortunately, the VISO 1 isn’t just good at playing music very loud without suffering damage to its internal organs, it’s also got quite a soft touch with the lighter stuff, making acoustic tracks from the likes of Bob Dylan, Patricia Barber and Van Morrison sound extremely good indeed. There’s a decent degree of width to the soundstage and a nicely resolved overall balance – that heavy bass isn’t overblown and doesn’t boom, so it’s never an issue, while the treble is also reasonably extended but without harshness. I’d pick that B&W’s Zeppelin Mini (and the big Zep for that matter) would allow more detail to stand out and would likely be more neutral as the NAD does tend towards a warm sound, but that’s based on audio memory, which is less than reliable. A side-by-side test would be revealing, but I definitely wouldn’t turn up my nose at any of these units. Bluetooth streaming from my iPhone sounded fine but there’s a sonic advantage to be had from using the dock. It’s quite marginal though, and unless you’re seriously into critical listening the convenience of wireless streaming might make it your preferred choice. I never used the VISO 1’s optical input because the unit’s form factor made it too big to be placed next to its natural partner – an ultra-thin LED TV set with woeful speakers. The NAD is a beefy bit of kit to site close to a TV without getting in the way; you’re basically dealing with something the size of a full blown home theatre centre speaker here. The ability to accept 24/96 signals is nice but this isn’t really a super high-resolution audio system capable of revealing the fine distinctions between 16/44 and higher bitrates.